Agrarian distress and allegations of corruption against the Bharatiya Janata Party (BJP)-led government at the Centre are likely to be the key planks for leaders from different opposition parties to come together at a crucial meeting on Monday, according to people familiar with the matter. At the meeting, meant to chalk out a framework for Opposition unity ahead of the 2019 Lok Sabha polls, the parties will also chalk out a strategy to counter the BJP during the Winter session of Parliament starting on Tuesday. “The meeting will focus on identifying issues that will be important for the people and can form the bedrock of the Opposition’s campaign against the Narendra Modi-led National Democratic Alliance (NDA) government in the coming months,” said a senior Opposition leader who asked not to be named. Top leaders from various parties have already started trickling into the Capital for the meeting. On Sunday, Dravida Munnetra Kazhagam (DMK) chief MK Stalin called on United Progressive Alliance (UPA) chairperson Sonia Gandhi and Congress president Rahul Gandhi. “We had a warm and cordial meeting and discussed a range of issues,” Rahul Gandhi said on twitter. “I look forward to continuing our dialogue and to strengthening our alliance that has stood the test of time,” he added. Stalin was accompanied by former Union ministers TR Baalu, A Raja and Kanimozhi as they wished Sonia Gandhi on her birthday. 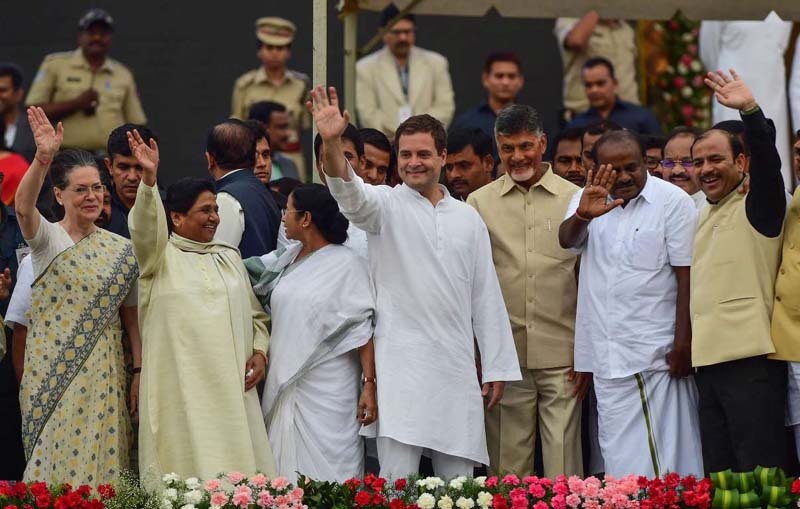 Those who have been invited for the meeting, arranged by Telugu Desam Party (chief) N Chandrababu Naidu, are Sonia Gandhi, Rahul Gandhi, Stalin, Bahujan Samaj Party (BSP) chief Mayawati, Delhi chief minister Arvind Kejriwal, Samajwadi president Akhilesh Yadav and his party colleague Ram Gopal Yadav, Rashtriya Janata Dal leader Tejashwi Yadav and his sister Misa Bharti, Kerala chief minister Pinarayi Vijayan, Farooq Abdullah of the National Conference, West Bengal chief minister Mamata Banerjee, Nationalist Congress Party chief Sharad Pawar, former Janata Dal (United) leader Sharad Yadav, D Raja of the Communist Party of India, former Prime Minister HD Deve Gowda of the Janata Dal (Secular). There is no confirmation yet about the BSP’s participation in the meeting. A second opposition leader pointed out that there will not be any effort to stitch a national, pre-poll, UPA-like alliance. Parties such as the Trinamool Congress and the Left have already expressed their reservations about a national pre-poll alliance. But doors will be kept open for state-wise pacts to minimise a split in Opposition votes. Apart from the allegations of corruption and the farm crisis, the opposition parties are likely to bring up the economic situation and the after-effects of demonetisation, the feud in the CBI, and incidents of cow vigilantism. A joint resolution is also expected after the meeting, said the first leader cited above. BJP national general secretary Kailash Vijayvargiya mocked the scheduled meeting of opposition parties , and said they should first declare a prime ministerial candidate before thinking of ousting the Narendra Modi government. “It’s really good to see opposition parties trying to forge an alliance to fight against us. But, first let them declare their prime ministerial candidate, then they should dream of fighting against us and ousting us,” he said.